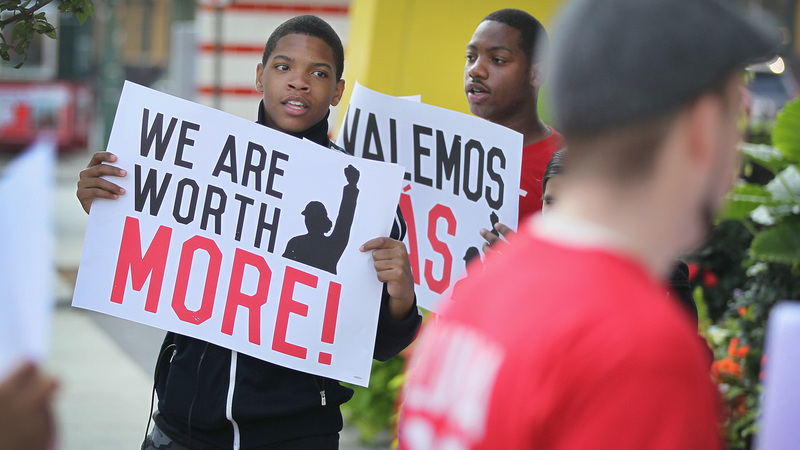 Chicago Council Strongly Approves $13 Minimum Wage : The Two-Way Saying that inflation has outpaced wage growth, the ordinance will raise the city's minimum wage to $10 by next July, with new increments added each summer thereafter. A new minimum wage was approved Tuesday in Chicago, where fast food workers and activists demonstrated outside McDonald's downtown restaurant this summer. By a 44-5 vote, Chicago's City Council set a minimum-wage target of $13 an hour, to be reached by the middle of 2019. The move comes after Illinois passed a nonbinding advisory last month that calls for the state to raise its minimum pay level to $10 by the start of next year. The current minimum wage in Chicago and the rest of Illinois is $8.25. Under the ordinance, the city's minimum wage will rise to $10 by next July and go up in increments each summer thereafter. The legislation includes several findings of a focus panel that examined the wage issue in Chicago earlier this year. The bill states that "rising inflation has outpaced the growth in the minimum wage, leaving the true value of lllinois' current minimum wage of $8.25 per hour 32 percent below the 1968 level of $10.71 per hour (in 2013 dollars)." It also says nearly a third of Chicago's workers, or some 410,000 people, currently make $13 an hour or less. The timing of the vote reflects a political reality, as Emanuel and other Chicago leaders are maneuvering ahead of the next election cycle. "Chicago Mayor Rahm Emanuel wants to pre-empt state action on local minimum wages," Northern Public Radio reports, adding that among those who approve the pay hikes, "Officials are worried business groups will push for Springfield legislation that prohibits municipalities raising their minimum wage higher than the state's." As NPR's Marilyn Geewax reported after the midterm elections, voters in Alaska, Arkansas, Nebraska and South Dakota approved binding referendums that raise their states' wage floor above the federal minimum.